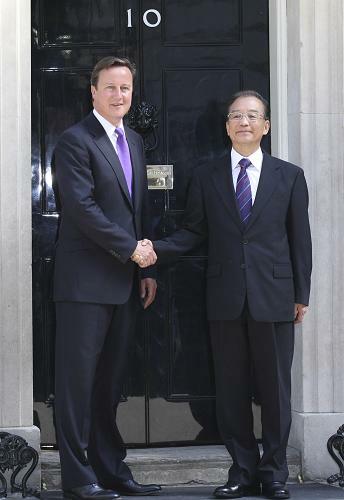 On June 27, 2011, Premier Wen Jiabao held talks with British Prime Minister David Cameron in the British Prime Minister's Office, London. Wen said that at present the international situation remains complicated and there is no major strategic conflict between China and Britain which, as countries with important influence in the world, have more common interests than differences. To maintain and develop China-Britain relations is beneficial to the development of both countries and will also drive positive changes in the world pattern. The two sides should seize opportunities to step up cooperation and handle challenges together. Talking about the issue of human rights, Wen pointed out that China and Britain should respect each other, respect the facts, treat each other as equals, properly solve differences through dialogue and increase mutual understanding. Wen suggested that the two sides further tap their cooperation potential and try to reach the target of US$100 billion of bilateral trade volume by 2015; set up a bilateral investment promotion working group and boost investment by implementing large projects; establish a China-Britain small and medium-sized enterprises cooperation forum to add strength to the bilateral industrial cooperation; contribute capital to set up a special fund, establish R&D centers and joint labs and enhance science and technology cooperation. The Chinese government encourages competitive domestic enterprises to participate in Britain’s infrastructure construction and supports domestic financial institutions in expanding business in Britain. The two sides should use the high-level cultural exchange mechanism to push forward the bilateral cooperation in the fields of education, culture, youth and media. Cameron noted that Britain attaches great importance to the relations with China and the development of China brings opportunities to Britain. His country expects to conduct dialogue and consultations with China in various fields including human rights on the basis of mutual respect. Agreeing upon Wen’s suggestions of strengthening China-Britain pragmatic cooperation, he hopes the two countries open market wider to each other, reinforce exchanges and cooperation in the sectors of trade, investment, high-tech, financial services, infrastructure construction, education and culture and work together to promote economic growth. Britain is willing to further strengthen communications and coordination with China in international affairs. The two sides also exchanged views on climate change, the Doha round of negotiations and other issues. After the meeting, the two leaders jointly attended the signing ceremony of relevant bilateral cooperation documents and met the press. Cameron held a grand welcome ceremony for Wen prior to the talks. On the afternoon of June 26, Wen met with the staffs of Chinese embassy in Britain and representatives of Chinese-funded organizations, overseas Chinese and Chinese students studying in the country.